Battle Armor The Pokémon is protected against critical hits. No moves will critically hit this Pokemon. found in what was once the ocean floor eons ago. the eyes on its back while hiding on the sea floor. which they became while hiding on the ocean floor. it has been discovered as a living fossil. floor. It also has eyes on its back that glow. have been discovered. The POK�MON has not changed at all for 300 million years. Emerald It is a POK�MON that has been regenerated from a fossil. However, in rare cases, living examples have been discovered. 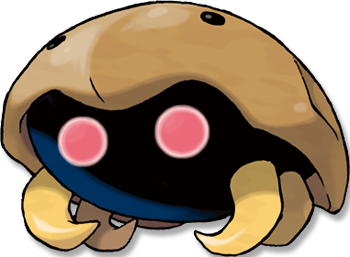 KABUTO have not changed for 300 million years. FireRed This POK�MON was regenerated from the fossil of an ancient creature. It protects itself with a hard shell. Leaf Green A POK�MON that was regenerated from a fossil found in what was once the ocean floor long ago. Diamond/Pearl It is thought to have inhabited beaches 300 million years ago. It is protected by a stiff shell. Platinum It is thought to have inhabited beaches 300 million years ago. It is protected by a stiff shell. Heart Gold On rare occasions, some have been found as fossils which they became while hiding on the ocean floor. Soul Silver This Pok�mon lived in ancient times. On rare occasions, it has been discovered as a living fossil. Black It is thought to have inhabited beaches 300 million years ago. It is protected by a stiff shell. White It is thought to have inhabited beaches 300 million years ago. It is protected by a stiff shell.